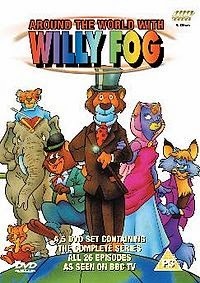 Classics Confession: Before reading this, my entire knowledge of the story of Around the World in 80 Days was based upon the Around the World with Willy Fog cartoon that was on TV in the UK in the 80s/90s. The title too, obviously, but mostly the cartoon. The idea is pretty simple. Phileas Fogg is spending an evening hanging out in his local Reform Club with some friends and musing about an article reporting the latest innovations in rail travel in India and boasting that it was now possible to travel around the world in, you guessed it, 80 days. With an indomitable commitment to punctuality and the unerring belief that one can achieve anything if one only has a suitable plan and timetable, Phileas Fogg declares (amidst much scoffing from his friends) that he will undertake a round the world trip in 80 days and makes a slightly outlandish bet with his Reform Club buddies that if he wins will see him a man of not insignificant fame and fortune but that if he loses will see him ruined. Fogg sets off on 2 October 1872 with his new French man-servant, Jean Passepartout, in tow to tackle the challenge and the adventure begins! I actually really loved Around the World in 80 Days. It’s kind of silly, it’s full of ludicrous coincidences and last-minute aversions of crises and it’s completely dated in so many ways but it’s just so much fun that I don’t care about any of those things. You obviously have to suspend the knowledge that the feat that was once so bold and brave would now be within any sufficiently well funded gap year student’s reach and go with it. I picked up a copy in Waterstones the other day to wave at Hanna and Ellie in an enthusiastic manner and am hoping that this review will have a similar enthusiastic waving quality. I’ve read quite a few books off my Classics Club list this year (more than I thought I would have by now, as it happens) and this has just edged out Villette to be my favourite so far. Fogg sets out on his epic journey pretty early into the novel, with Fix (a misguided but super keen English policeman) setting off on his own slightly madcap journey not long after. Because all of the characters are against the clock in their own ways, the pace of Around the World in 80 Days is swift and relentless. In a good way. In a turn of events that is only even faintly amusing to me with the benefit of hindsight, I spent two and a half hours in a traffic jam listening to this one day and although it would be a lie to say that the time flew by, it was at least easy to get caught up in Fogg’s story and escape my own lack of movement intermittently. Fogg is a strange kind of unflappable character who bears all drama with a practised stoicism and he contrasts pretty nicely with the blustering Fix. It was Passepartout that I really had a soft spot for, though. Delighted at the prospect of working for a meticulously organised and notoriously predictable new master, Passepartout is a pretty reluctant travelling companion and he’s just kind of adorable. He sort of flaps along after Fogg, getting into scrapes and generally scrabbling around. In another book or with a slightly less befuddled character, I think I might have found him annoying but I couldn’t help but root for him. I think that the key is that the book doesn’t take itself too seriously – there’s a case of mistaken identity, plenty of peril (which is at least mild and occasionally moderate) and some very English and rather polite 19th Century banter that are all just generally quite ridiculous but also utterly charming. Basically, as it turns out, the cartoon that I watched as a child is quite faithful to the book on which it is based, near-misses and diversions to attempt daring rescues of damsels in distress and all. If Wikipedia is to be believed, the Willy Fog version is actually the most faithful reproduction of the story that there is and what I had dismissed as the hamming up of the original to entertain British toddler masses of a Saturday morning was instead a jaunty introduction to Jules Verne’s slightly haphazard approach to adventure stories. Thankfully, I had long since forgotten the ending of the series (if I ever even made it to watch the end as a fickle child…) and I got to be surprised by it. I had no idea that the book ended in the way it does and obviously won’t blather on about it and ruin it – I know that it’s a classic and everybody knows the gist but I figure that if I’ve managed to have an insufficient clue about goings on to screech and squawk my way through the ending, other readers might too and far be it from me to ruin it for you! Verne is a lot less stuffy than I’d thought and isn’t afraid of a few random tangents if they even vaguely fit the story and will add any measure of entertainment. I’m less keen on the idea of 20,000 Leagues under the Sea because I don’t have a lot of love for the sea generally so I’m not overly bothered about snatching that up just yet but I definitely want to read Journey to the Centre of the Earth sooner rather than later. 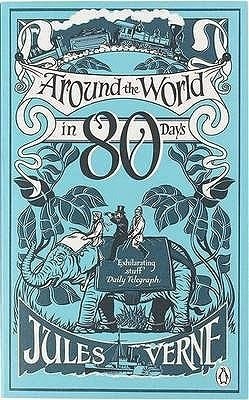 Overall: If you fancy a classic but don’t want anything too heavy or with sentences that are so long and tangled that they will make your brain ache, Around the World in 80 Days is one of the best books I can think of to recommend.